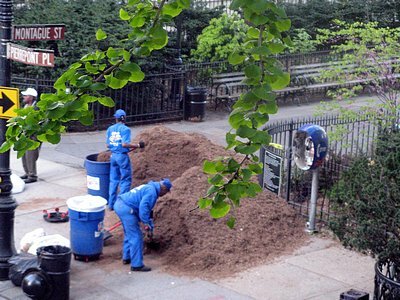 The heaps of brown stuff you may have noticed distributed along the Promenade—or as in this photo at the Montague Street entrance—are mulch to be used on the Promenade gardens. Promenade Gardener Jonanthan Landsman advises us that it will be distributed Saturday morning by a large volunteer group. On Saturday morning, Jonathan Landsman and his crew were busy planting by the Clark Street entrance to the Promenade. More photos and text after the jump. 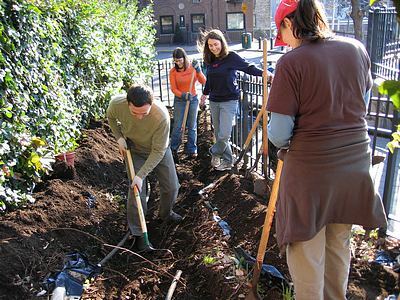 This in from the Brooklyn Heights Playground Committee: Jonathan Landsman, the terrific Brooklyn Heights gardener, is looking for volunteers of all ages to help him plant annuals in Pierrepont Playground. This is a great family activity with older children. 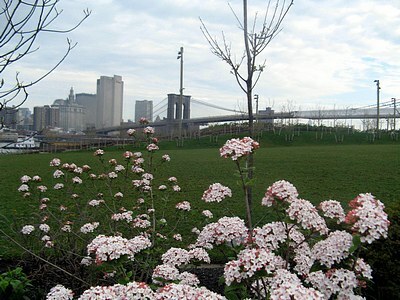 The Brooklyn Eagle reports on the wonderful benefit of the Promenade Gardner’s Bake Sale on June 4 – love-er-ly flowers!